I never read any of the Lord of the Rings books and I never saw the films when they were in their prime. I’m not much of a reader so I have no intention on reading the books anytime soon but I eventually saw the movies for the first time several years back and they’ve become some of my favorite films. I obtained the trilogy on blu-ray and it’s the kind of film series where if I start watching it, I can’t stop. I have to watch all three films in a row so these movies ending up turning into an all day event. Developed by Monolith Productions and published by Warner Bros. Interactive Entertainment, Middle-earth: Shadow of Mordor was released for the current gen consoles and PC in September, 2014, and last gen consoles in November of that same year. I’ve beaten this once before and enjoyed it for the most part. For this review I played the Game of the Year Edition which contains all previously released DLC including the Lord of the Hunt and The Bright Lord campaigns and it also includes all character skins. The main campaign takes place between the events of The Hobbit and The Lord of the Rings. You play as ranger and captain of Gondor, Talion. Talion and his family are slaughtered by Sauron’s Orc forces. After Talion’s death, Celebrimbor, a wraith, merges with Talion’s body, essentially resurrecting him. I guess you could say you’re playing as two characters. Talion’s ultimate goal is to avenge the death of his family and Celebrimbor’s goal is to uncover his own identity since he’s suffering from amnesia. On your journey you meet several characters, even some familiar faces, and complete various quests to progress the story forward. Outside of obvious characters I’ve seen in the films, I have know idea if some of the others are in the novels so I can’t say how close this game sticks to the source material. In Lord of the Hunt, you once again play as Talion, and this time you assist Torvin, a character you meet in the main campaign, and must eliminate five Warchiefs. Torvin teaches you new ways to hunt and gain control of various beasts in the world, and you must use these new skills to take down the Warchiefs. In The Bright Lord’s campaign, you play as Celebrimbor and must build your own army of Orcs by branding the Warchiefs and then take your army and fight Sauron. The voice acting in all of the campaigns is decent with some notable voice talent including John DiMaggio, Nolan North, and even Phil LaMarr. Unfortunately, the stories in each campaign feel more like fan service than anything, and in my opinion, they’re not that engaging. The DLC campaigns are also quite short. You can probably complete both in under four hours. Before getting into the nitty gritty of the gameplay, I’m going to talk about the world and what you can do. 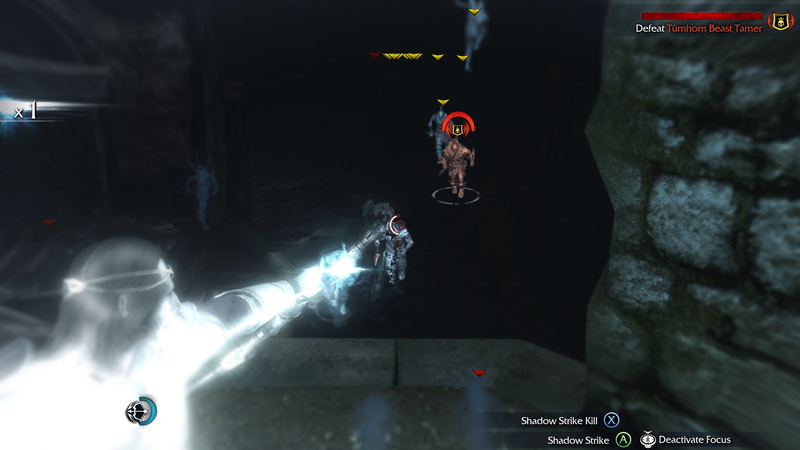 Shadow of Mordor borrows elements from both the Batman: Arkham series and the Assassin’s Creed series. Talion can walk, run, crouch, vault over obstacles, and climb very easily. In fact, the climbing is very smooth and fluid. As long as you hold the jump button, Talion will keep climbing without any resistance. If he can latch onto a wall, he can make it to the top without a problem, and he can also jump quite high so getting to the top of any structure never takes long. However, just like in Assassin’s Creed, Talion will automatically latch onto things and he’s magnetized towards the closest object. If you need to get away quickly or jump somewhere specific, Talion may not always jump where you want him to and that can become frustrating. In the main campaign there’s two major areas to explore and you travel to the second area for the first time about half-way through the game. If you’re hoping this game includes a large open world, you would be very mistaken. In fact, both areas are quite small and I really don’t understand why they couldn’t merge both areas together. You can enter the Wraith World to highlight enemies, see tracks, and is basically like detective vision in the Batman: Arkham games. You can climb and forge towers to reveal regions of the map which means things like collectibles become visible on the map and new missions become available. The towers also act as fast travel points as well as allow you to advance time. In The Bright Lord campaign, you must defeat specific Orc captains to reveal regions of the map and once a region is revealed, a tower becomes available as a fast travel point. Throughout the land are various beasts like Caragor’s and Graug’s that will attack you but you can also attack them and even ride them. You can ride Caragor’s and command them to bite enemies or use them to traverse the land faster. If you manage to control and ride a Graug, you can command it to attack Orcs and even eat them to regain health. The Lord of the Hunt campaign introduces Caragath’s which act just like Caragor’s except they can perform stealth kills. This campaign also introduces Wretched Graug’s which can vomit on enemies to kill them at the cost of health. As you play through the main campaign you can complete various challenges which reward you with XP. These include things like consuming a specific amount of herbs or killing specific creatures throughout the land. There’s different types of herbs you can consume and they all seem to regenerate your health so that just seems kind of lazy. One of the biggest downsides to this game is that it never stops holding your hand. There is no sense of discovery because everything is usually spelled out for you. There are collectibles like Artifacts that reveal some of Celebrimbor’s memories, and Ithildin wall pieces, but you don’t really have to go looking for them since you can always find them on your map as long as the region is revealed. The same goes for the collectibles in the DLC campaigns like the Torvin’s Journal Entries in Lord of the Hunt and War Letters in The Bright Lord. But the game also holds your hand in other ways. It’s one of those games where blips and icons cover the map and your HUD. Exactly what you need to do, where it is, and how to get there is never an issue. This is both good and bad. It’s good in the sense that you should never really get lost or confused but it’s bad because you never have think about anything. Everything is provided to you. All of the campaigns play out through quests and even side quests. You complete main quests to progress the story and side quests to earn XP and Mirian. Side quests usually include things like killing a specific amount of enemies within a time limit, freeing slaves, and stuff like that. Most quests in all three campaigns include bonus objectives like avoid detection, kill a certain amount of specific enemy types, and in the main campaign, completing bonus objectives rewards you with bonus XP and Mirian. In the main campaign you can utilize special abilities to aid you during combat and some of the abilities are locked behind the completion of certain quests. When you earn enough XP, you earn an ability point. You spend ability points to purchase abilities from two trees – Ranger and Wraith. The Ranger tree focuses on stealth and melee abilities. The Wraith tree focuses on more supernatural abilities. You can spend Mirian on different weapon upgrades that apply to your dagger, sword, and bow, inlcuding the purchase of new Rune slots for each weapon. Runes grant your weapons bonuses like increased chance of critical hits, reducing focus depletion rate, immunity to poison, and stuff like that. You acquire runes from fallen Orc captains and Warchiefs and can only equip five runes per weapon. You can sell off any runes you’re not using for Mirian. Which ones you choose really depends on your play style and simply what runes you prefer. I believe the runes dropped from fallen Orcs and Warchiefs are randomized and the runes, abilities, and weapon upgrades, are just some of the ways Shadow of Mordor encourages replay value. Even after completing each campaign you can still navigate the world, kill enemies, acquire runes, and if playing the main campaign, obtain any remaining abilities or weapon upgrades. If you’ve played the Batman: Arkham games, or Mad Max, the combat here is pretty much identical. Shadow of Mordor utilizes the freeflow combat system and if you don’t like that system, I would say you probably won’t enjoy the game. Combat makes up ninety percent of the gameplay. You can engage enemies head-on or take a stealthy approach. When you enter ranger mode and whip out your bow you use focus to slow down time which does drain your focus indicated by a meter on the HUD. Focus will slowly recharge over time. In ranger mode you can aim at enemies with your bow and charge up your shot to do major damage. A well placed headshot can usually kill an enemy instantly. However, you only have a certain amount of arrows and can acquire more by finding them scattered throughout the world. The actual melee combat is simple. Mash the attack button, wait for enemies to attack and when you’re prompted to counter or dodge, press the corresponding button. Normally you get overwhelmed by enemies but mastering the combat system really isn’t that difficult. 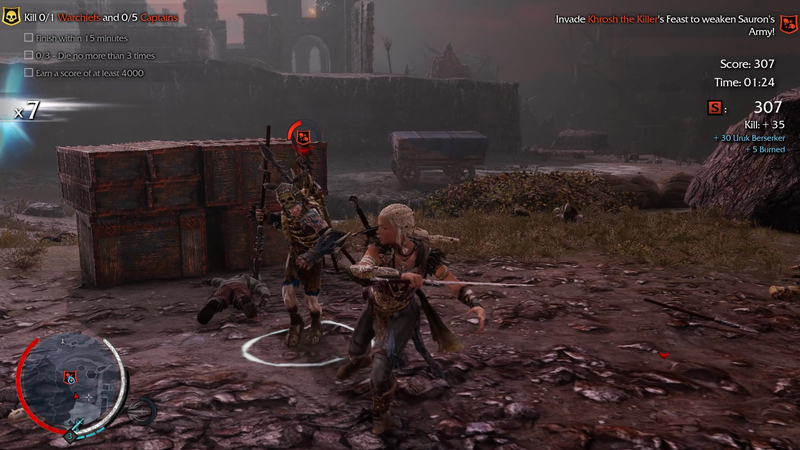 As you progress, encounters become more challenging because you’ll have to deal with multiple Orcs firing arrows, carrying shields, and berserker Orcs that require you to stun them first before you can attack. But the more challenging the encounters become, the more abilities you should have unlocked so it’s balanced out nicely. Chaining hits together adds to your hit streak and once your streak reaches a certain amount, you can execute enemies which means you can kill them instantly. You can also execute any downed enemies as well. Late in the main campaign you’ll acquire the brand ability which lets you brand enemies so they fight for you and you can even command branded Captains and Warchiefs to attack each other. This is actually a really cool mechanic since you can essentially build your own little army. Finally there’s stealth. I guess you could say Shadow of Mordor doubles as a stealth game because several quests force it upon you, as in, you must eliminate or brand enemies without being detected. In fact, I found that there were way too many forced stealth quests in The Bright Lord’s campaign. Stealth is simple, sneak up on enemies to execute them quickly. You can kill them from behind, above, and in The Lord of the Hunt, use Caragath’s to perform stealth kills. Orcs have icons above their head that indicate their awareness. If the icon is yellow they are investigating a disturbance and if the icon is red, they can see you. If you’re within a stronghold and detected, Orcs can run to an alarm and set it off, alerting all of the Orcs within the stronghold to your presence. In The Bright Lord’s campaign, Celebrimbor can utilize the Power of the One Ring he wears which means time slows down, he has unlimited fire arrows, and can perform an unlimited amount of executions, all for a limited time. You can complete side quests to increase the duration of the Power of the One Ring. To defeat Orcs, you always engage them directly but can also use the environment to your advantage. You can shoot barrels and other explosives to injure and kill any enemies in the blast radius. You can free Caragor’s from their cages and they will attack Orcs. 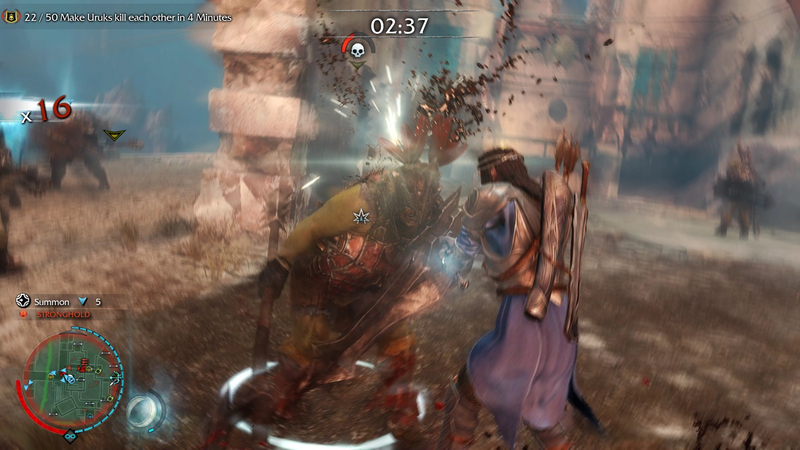 You can even shoot down Caragor bait to attract Caragor’s or shoot Morgai Fly nests to distract enemies. Maybe you’d rather take a more subtle approach and poison Grog barrels so when Orcs drink from them they become suspicious and attack each other. In The Lord of the Hunt you can shoot bait to lure Ghuls or Wretched Graug’s. 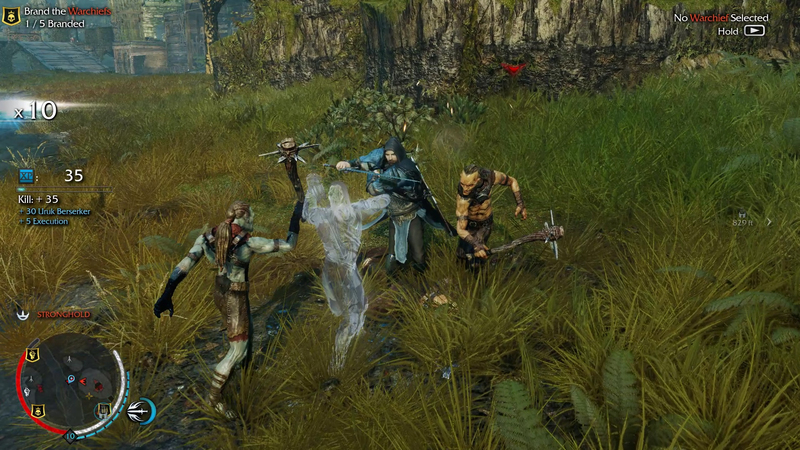 Shadow of Mordor gives you plenty of options when it comes to encounters and trying different approaches is all part of the fun. That is until the game forces you to approach in a specific way. The real highlight and focus of the game is the Nemesis System, which is in my opinion, a very cool concept. The stories may be forgettable, and the gameplay may feel familiar, but the Nemesis System is quite intriguing. In all three campaigns, Orcs are everywhere and make up Sauron’s army. You have regular Orc’s, Captain’s which are more powerful and are normally found within camps, and Warchief’s which are found within Strongholds. From the pause screen, you can view Sauron’s army of Captain’s and Warchiefs. Some Captain’s double as Warchief bodyguards. Whenever an Orc is killed, another is usually promoted and takes his spot. There specific mission types that fall under the power struggle category. These missions always involve you interfering in a Captain’s business or intervening a battle between multiple Captain’s to manipulate the ranks. Manipulating the ranks becomes very important when you learn the branding ability because you can brand Captains and have them betray Warchiefs, among other things. In fact, branding a Warchief’s bodyguards can make taking down a Warchief a lot easier. Once a Warchief is down, a captain is normally promoted to Warchief and ideally, you would want it to be one of your branded Captains. If a Captain or Warchief manages to kill you, they will remember you and even make it a point to let you know the next time you encounter them. Every Orc Captain and Warchief have strengths and weaknesses that can be exploited. For example, some Orcs are invulnerable to ranged and/or stealth attacks but may fear Caragor’s or fire. To reveal the identities of Captains and Warchiefs you haven’t discovered yet and to obtain information on their strengths and weaknesses, you need to gain intel. Any Orcs with a green icon above their head usually have this intel and you must interrogate them to obtain it. All three campaign’s include the Nemesis System, in fact, eliminating or branding the five main Warchiefs is basically the ultimate goal of both DLC campaigns. One of the downsides to these campaigns is that you can’t command any Captain’s to betray Warchiefs. The Lord of the Hunt campaign forces you to use your new hunting skills against the Warchiefs. The Bright Lord’s campaign seems to be the most challenging of the three. The idea here is build your own army of Orcs but there are no power struggle quests and I think the only time you really encounter any Captains is when you’re trying to take over a region or when they’re accompanying Warchiefs. Taking down Warchiefs in this campaign can really drag on because they seem to be invulnerable to most of your attacks and this campaign really wants you to brand every enemy and use them to fight the others. I found myself constantly getting getting overrun, even with my own little army of Orcs, and often running away to find herbs to restore health in the middle battle. Not only is the Nemesis System the highlight of the campaigns, but there are two game modes that revolve around this system. Nemesis Forge is basically the campaign stripped of everything not related to the Nemesis System. You can only participate in Power Struggle missions, hunt down Captain’s and Warchiefs, and manipulate Sauron’s army. That’s it. Then there’s the Trials of War mode where the goal is to kill Captains and Warchiefs but instead of earning experience, you earn points for a high score. There’s different types of trials with different objectives that involve killing a specific amount of Captains and Warchiefs and limiting how many times you can die, among other things. This mode also carries over your abilities and weapon upgrades from the campaign so you’re probably better off trying these once you have acquired all of the abilities. If you do enjoy the combat system then it can actually become quite addictive here. The combat can feel brutal at times and you can execute enemies in really cool ways. You can grab an Orc and shank him several times before slitting his throat and sometimes you can even decapitate them. There are different variants of Orcs. Some fire arrows, others throw spears, some carry shields, and I found that the tougher encounters include multiples of each enemy type. Enemies with shields require that you either break the shield first or jump over them so you can attack them from behind. Some attacks cannot be countered and you must dodge and when you’re getting attacked from multiple enemies at once, trying to counter one and dodge another, it can be easy to fumble around with the controls, and then you get attacked, usually breaking your hit streak. Dying can be frustrating because not only will the Orc that killed you get promoted, but if you died during a quest, you usually have to replay through it. The Orcs make up most of the enemy encounters but you’ll eventually encounter Ghuls which always appear in large numbers. They normally try and slash you and some can even spit poison. One swing of your sword can kill a Ghul instantly but they can easily overwhelm you and that’s the real threat. They’re just annoying, really, but only appear at night and in caves. There are a few traditional bosses battles throughout each campaign and they normally consists of attacking them in specific ways repeatedly along with quick time events to be defeated. The final boss in the main campaign is actually quite disappointing. You do get to fight Sauron in The Bright Lord’s campaign and I thought that was pretty cool but the entire battle, itself, can be really tedious. 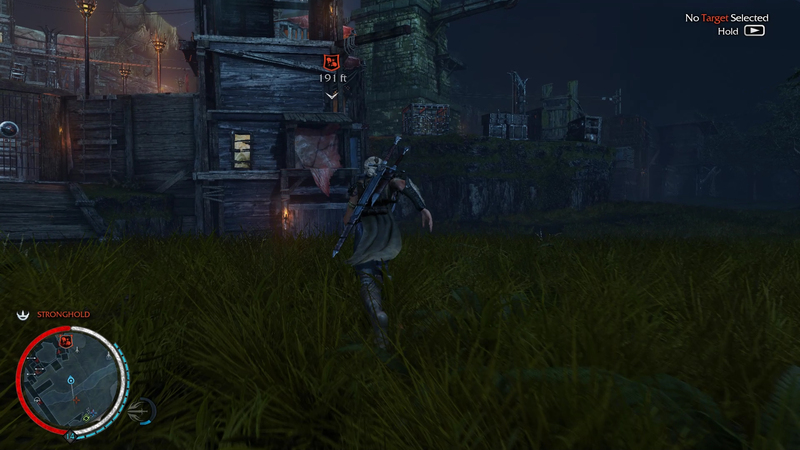 Shadow of Mordor doesn’t look too bad but I do wish there was some more environmental variety. Even with two major areas, the world, itself, isn’t large and after a while, everything kind of looks and feels the same. You’ll always be revisiting the same areas so more visual variety would have been appreciated. Luckily, there’s a good amount of color and a decent amount of detail in the environments. There’s a night and day cycle, some areas are covered in foliage like grass and bushes, other areas are muddy or swampy, and whenever it rains, everything has a sheen and wet look about it. Slash an Orc and you may see his face and parts of his body covered in blood, all of the animations are fluid, and stabbing an Orc in the face is always satisfying. On the audio side, there doesn’t seem to be much music, and if there is, I clearly don’t find it memorable. There seems to be a lot of ambient stuff which is disappointing, considering how great the film series soundtrack is. The Orcs like to grunt, scream, and growl, and after a while they all seem to sound the same. The actual sounds of combat are quite satisfying with loud slashes and stabs and every execution sounds as brutal as it looks. As for the performance, even with v-sync enabled in-game I still saw some serious screen tearing during gameplay. To fix it I had to disable it in-game and force it through the nVidia Control Panel. Although, that meant screen tearing would be rampant during cut scenes for some reason. I know some players find Shadow of Mordor boring or they lose interest in it quickly. I think you really need to like the freeflow combat system to enjoy this. Even though its a relatively simple system to master, I enjoy it. I think it’s fun and there’s an addictive quality to chaining hits and kills together. But if you don’t like it, then, yeah, I can see why this game might turn you off. I think the Nemesis System is a very cool concept and would love to see it fleshed out more in the sequel. With the freeflow combat and Nemesis System to keep you busy, you could be playing this for quite a while. I’m not sure if the Nemesis System actually comes to an end because as far as I can tell, every time you eliminate a Captain or Warchief, another will just take it’s place so I guess it just goes on and on. I like that because you can always return to the game and have something to do. It may get repetitive after a while but like I said, if you enjoy the combat, there’s a lot of fun to be had here. I can’t say Shadow of Mordor introduces a ton of new things but the Nemesis System is the highlight of the game and I would honestly love to see other games try something similar and maybe add to it in some ways to flesh it out even more or make it more strategic. Middle-earth: Shadow of Mordor is a fun game and I think fans of The Lord of the Rings franchise will have a really good time with this. Unfortunately, the stories are not that engaging and the characters are not fleshed out enough. There is no multiplayer but there’s three campaigns, two other game modes, and addictive gameplay. The game does have the problem of constantly holding your hand but it doesn’t really take away any enjoyment. The Nemesis System is the big focus here and gives the game a ton of replay value. If you enjoyed the Batman: Arkham or Assassin’s Creed series, I would say give Shadow of Mordor a shot. And once again, if you don’t like the freeflow combat system then this probably isn’t the game for you. In my opinion, the Lord of the Hunt campaign is the most disappointing campaign of the three since it really doesn’t introduce anything that exciting and both DLC campaigns are extremely short. After you complete the main campaign, I would say the Nemesis Forge game mode is the best way to play since it focuses on two of the game’s biggest strengths and if you’re a dedicated fan of The Lord of the Rings franchise, the collectibles found in the campaigns do provide a ton of lore. Ultimately, I would recommend Shadow of Mordor, especially now that you can obtain the Game of the Year Edition for pretty cheap.